The main unit of currency is the "Leu"(sg) or "Lei"(pl). A "Leu" is sub-divided into 100 "bani" but due to the devaluation of the "leu", prices do not usually include "bani" and the unit of currency goes largely unused. 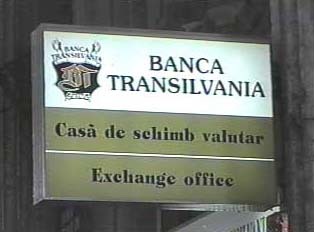 Foreign money can be exchanged in banks and private exchange offices. The rates are usually similar in both places. There is usually no fee for exchanging, although hotels or tourist places might charge a fee. Foreign customers will need a passport when exchanging in a bank. Typical bank hours are 7:00 a.m. to 5:00 p.m. When exchanging money at private exchange offices, one will not need to show a passport. One typically needs to ask for a receipt; a receipt is not offered automatically. One should NEVER exchange money on the street! The few ATMs in the country take only Romanian debit-cards. Services for wiring money between banks in the United States are also limited to a few of the larger banks or Western Union. Traveler's checks can also be used in tourist areas. Credit cards are accepted at big hotels, car rental places, and other major tourist attractions. However, credit cards can not be used at any but the finest restaurants.